Whether it’s hot or cold, wet or dry we never quite seem happy about the weather! Recently here in the UK we had a bit of a heat wave. Our animals aren’t used to such temperatures so here are my tips on how to care for your horse when it’s scorching. 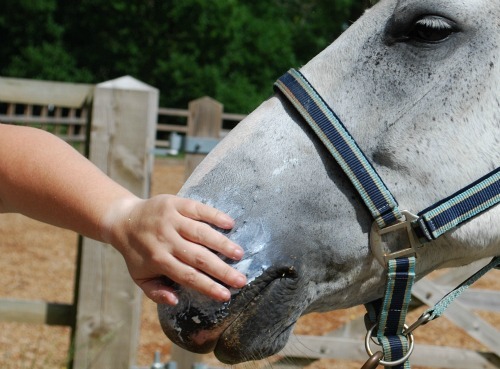 Pink skinned horses are particularly prone to this – especially in exposed areas such as the muzzle. One of my horses is a grey. A few years ago I missed creaming his muzzle up with sun cream, he got burnt. His nose then blistered and an infection spread up his blaze which needed treating by the vet. Now I’m OCD about making sure if it’s going to be vaguely sunny he’s creamed up. This horse hates this and when I first started doing it would really throw his weight around and even rear at me. He’s better these days but because I’m small when he sees me coming with the tube he pops his head in the air so that I can’t reach. He doesn’t get I’m smarter than him though. I have him on the head collar, climb up the mounting block so that I’m taller than him, put plenty of cream on my hand and then quickly get his muzzle. He ends up with far too much cream on and it looks a bit of a mess but it soon soaks in – better that, than a burnt nose again! If your animals are out in the field when it’s hot it’s great if they can have a bit of shade. There are field shelters or trees – this gives them a bit of a break if they so choose to use it. That or you may want to stable them during the day. Make sure field troughs are regularly topped up. The heat and the summer invariably brings flies!!! Personally I don’t think there’s a way of stopping them completely – you can only try your best. I’ve tried sprays, ointments, supplements and rugs. The supplements didn’t seem to make much difference and were quite costly. The fly rugs and masks again were costly and within 24 hours one horse had ripped his in two – the other has very flexible ears and can get his mask off when rolling within minutes. These days I use a horse friendly fly spray bought from a saddlery store. In early spring my geldings sheath get nibbled by gnats – NASTY. To combat this I use a balm that’s been checked that’s ok for sensitive areas. This I cream on it, it also has a soothing effect on any previous bites. This has worked really well. If your horse is hot think about hosing them down. This is essential after exercise when it’s really hot. If it’s exceptionally hot you may want to ride early in a morning or late in an evening. It won’t be such hard work for you and your horse and will probably be a pleasanter experience all round. You may have to alter your exercise regime as well depending on how your horse reacts to heat and how fit it is. Take a drink with you and if you feel you’ve had enough you probably have. You can’t look after your horse properly if you’re collapsed in a heap because of heat exhaustion yourself. • Elevated respiration in an inactive horse – breathing a lot or quickly. • An increased pulse in an inactive horse – one that doesn’t drop after several minutes or increases. • Profuse sweating or no at all. • A high body temperature. Remember you probably know your animal better than anyone else – if you don’t feel right about something and think he’s struggling, call a vet.